Following hot on the heels of my last post about Albannach‘s monthly whisky club is this more timely write up of February’s gathering. Shifted downstairs into a darkened corner booth of Albannach’s A-Bar due to a private party having booked the entire upstairs we had a few of us from last time and some new people and, in a happily shocking turn for a whisky event, even numbers of men and women. Hopefully whisky producers will continue to stop advertising seemingly solely to gentlemen of a certain age and whisky geeks, and the whisky community will continue its trend towards no longer just being the domain of bearded men with notebooks – I for one am happy to see less people who look like me at whisky events… Anyways, on to the whisky! First up this month was Cat from Albannach with a bottle of Inish Turk Beg. 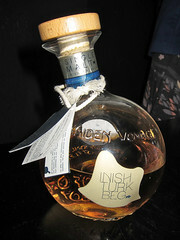 It’s the first release of a new irish whiskey, limited to only 2888 bottles, named for a private island off the west coast. It’s a whiskey that’s covered in marketing and digging through their website doesn’t get much information about the spirit itself – the island is owned by Nadim Sadek who has set it up as a brand in of itself, encompassing food, art, music and now whiskey. According to the site it’s finished in poítin barrels that have ‘long lain’ on the island, cut to bottling strength using rainwater collected on the island and sold in handblown bottles made with glass that contains sand from the island. There’s no information about the whiskey on the web apart from a few reviews and some theories from people who haven’t tasted it that it’s very young Cooley spirit aged in former bourbon barrels. However, I reckon it’s had a little bit of time in the barrel and despite the marketing guff I thought it was rather nice – on the nose it was salty and floral (violets?) with caramel and a light woody smokiness; to taste there was vanilla up front, a spicy middle with a bit of gravelly minerality and a dry honeyed woody finish. Water dropped out some of the sugary sweetness, adding more honey and a little bit of woody tannin. It’s a bit pricey for my liking (at about £125 per bottle) but it’s not bad, despite the story around it seemingly being more important than the liquid. I have already claimed the empty bottle from Albannach when they finish, if Cat doesn’t get it first (which she will)…it’s very pretty. 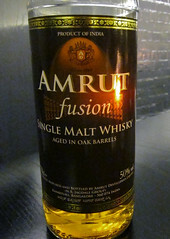 Next up was Will Lowe, who brought along some Amrut Fusion. It’s one I tried, and have no memory of, at last year’s London Whisky Lounge festival and one that is sitting on my ‘tasting shelf’ (aka unused monitor stand that’s part of my desk) as part of my next Whisky Tasting Club box (that I’ve had for about a month…I should get onto that). It’s (mostly) from India and is probably the most well travelled whisky I’ve ever tried. The Fusion part of its name comes from the fact that it uses both Scottish and Indian barley in its manufacture, with the Scots grain being peated and the Indian not. The Indian barley is grown in the Punjab before being sent to maltsters in Jaipur. After malting it meets the Scottish barley in Bangalore at Amrut’s distillery, where it is distilled and aged. From there it makes its way to the UK – quite a trip. On the nose it had caramel popcorn, a bit of gravel and a hint of woody smoke. To taste it was universally described as ‘pinched’, with its stronger 50% bottling strength compressing the flavours behind an alcoholic kick. I got some more minerals and a bit of peaty smoke, but mainly it was hot and spicy and didn’t reveal much. Water tamed it to a sweet and stony dram with an edge of farmyard, showing it to be quite pleasant under the fire. 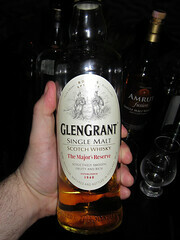 Third came Cat’s colleague Carolina who brought a bottle of Glen Grant Major’s Reserve. Glen Grant is a highland distillery on the edge of the lowlands which, from my recent reading of Richard Paterson’s Goodness Nose , seems to make lighter spirits in a more traditionally lowland style. I’d not tried this one before but Carolina had chosen it as one that she felt was a good introductory whisky – working in a restaurant like Albannach she often gets asked for recommendations for non-whisky drinkers and this is one at the top of her arsenal. On the nose it was buttery, with butterscotch, apples, custard and a light spice. To taste it was quite sweet for with a nice chunk of wood to balance it. 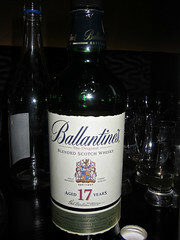 There was liquorice root, sour polished wood and a little hint of menthol at the end before a short sweet wood finish. Water brought out more candied sugar on the nose but killed the flavour, leaving it simple, sweet and sour. This was rather easy drinking and one of my favourites of the night – a very good whisky for someone who isn’t sure what they’d like. 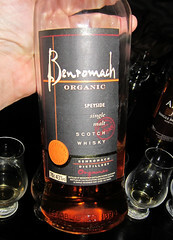 Next was me, with a bottle of Benromach Organic that I picked up from my visit to the distillery this time last year. I’ve not tried it since the tasting I did last March, but I remember being rather keen on it at the time. It’s the first Soil Association certified organic whisky, although a number have appeared since release, and is unpeated and aged exclusively in new wood casks. 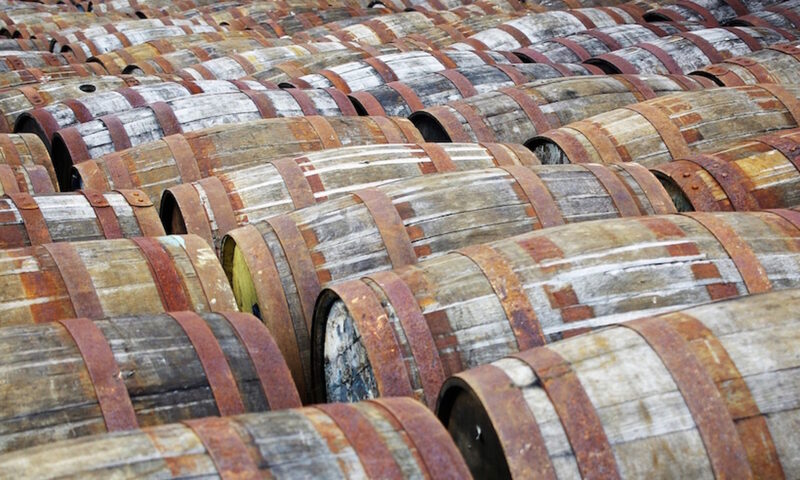 When I first tried it I assumed the choice of new wood was due to the difficulty of obtaining organically certified refill barrels, but it looks like other distilleries have managed it so I’m no longer sure of the motivation for the cask choice. Since I last mentioned the whisky it has now pretty much sold out everywhere, with its replacement, the peated ‘Special Edition Organic’, not going down anywhere near as well – hopefully the unpeated version will reappear soon. On the nose we got an interesting gluey smell (although a table of people arguing of what type of glue it smelled of hints towards a number of mispent youths) which in the end we settled on being wet papier mache (although PVA glue and primary school paste both came up) along with tea and bananas. To taste there was much more wood than I remember, overwhelming the palate with dry and dusty oak, and new wood spiciness a bit like an unrefined bourbon. Along with that there was the expected vanilla and some red fruit. Water tamed it a little bit, although while it brought out some sweet butter it did also soften some of the wood to damp cardboard. Not as much of a favourite this time as I remembered from before. Last up was Lucas with a bottle of Ledaig 10. This comes from the Tobermory distillery on the Isle of Mull, where their unpeated spirit is named after the distillery and their peated Ledaig, it’s old name. It’s got a bit of a reputation for unevenness, with good whiskies at one end(such as the 5 year old Ledaig that Berry Brother’s bottled last year, which picked up various accolades) and filthy whiskies at the other (such as the Tobermory 15 that was tasted at Whisky Squad #3) but not a lot in the middle. They seem to have had a bit of a rebrand recently and I was quite keen, although apprehensive, to try the Ledaig. On the nose it had black junior school plimsolls (fresh from the box), tinned sardines, wet leaves, damp soil and a hint of lemon. To taste it had coal and tar, a bit of unscented soap, lots of minerality and salty preserved lemons. Water killed the interesting flavours, leaving just a wet and smoky mess. Despite the non-traditionally appealing flavours I list above this one was my favourite of the night – totally different to the rest of the whiskies with a very different smokiness to that which you normally get from peat. The harsh rubberiness of the spirit is not going to be for everyone, but if you like a sensual assault it’s worth a try. Hopefully there’ll be more Whisky Hub shenanigans next month – many thanks to Cat for throwing it all together again. As with last time, let me know if you are interested in coming along (probably the last Wednesday of the month) and I’ll see if there’s space. Irish whiskey, no age statement, 44%. 1litre bottles available for £125 from Harvey Nichols. Indian whisky, no age statement, 50%. ~£35 from Master of Malt. Highland single malt Scotch whisky, no age statement, 40%. ~£20 from The Whisky Exchange. Organic Speyside single malt Scotch whisky, no age statement, 43%. Sold out, but was about £35 from Master of Malt. Blended Scotch whisky, 43%. ~£40 from Master of Malt. Single malt Highland Island Scotch whisky, ~£30 from Master of Malt (although I’d check that is the new edition, as the image on the page isn’t and the tasting notes are quite different from the rubbery punch we got). Great write up Billy, nicely done. Ive already selected my secret weapon for March. Looking forward to it! 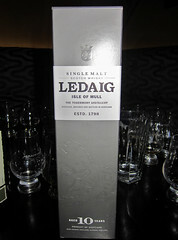 I have some Ledaig and I really, really like it. It’s only a wee bottle but I’ve used it sparingly as I don’t know when I’ll get another.